Multiple editions of IMatch and IMatch Anywhere are available. IMatch is a Digital Asset Management system (DAM) for Windows and the Web. It solves the problem of managing collections of digital files by making them searchable and accessible. IMatch provides tools for organizing, finding, viewing, presenting and converting images, music, videos, PDF and Office documents and all other digital files. IMatch is available since 1998 and used in over 60 countries. It's lively user community and the dedicated software author drive IMatch's evolution. 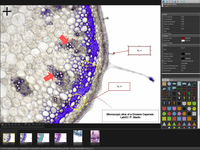 I have used IMatch 5 since 2015 and rely on it exclusively for cataloguing my research photos. Pros: Easy to use exif data tool that I use to edit "date of capture" metadata when I take photos in different times zones, but forgot to change the camera's regional settings. The keywording system in IMatch is well-designed, in fact the best I've ever seen on any software that I've used. By using a Controlled Vocabulary consisting of nested keywords, a user can easily find and apply keywords to their images. Users can import their keyword lists from Lightroom, or use a pre-existing paid or free Controlled Vocabulary list. The developer responds very quickly to questions on the user forum and fixes bugs very rapidly. IMatch 5 is updated regularly and, to the pleasant surprise of users, often includes new and useful features. I use the keywording controlled vocabulary in IMatch 5 to analyze and code research photos and videos and in this way, supplement a similar process in QDA software where I analyze and code textual data describing the images. Cons: There's very little to dislike about Imatch. As of 2017, a lack of detailed training videos probably detracts or inhibits more users from using it. IMatch has many advanced features and learning how to use these will take a considerable investment of time. A Linux and Mac version would be great. Comments: Over the past years I've amassed about 30k photos and videos that were basically just sorted by date. While I had dipped my feet in organizing my photos many years ago using the previous IMatch 3, I didn't pursue the matter to no fault of the software, but because I had overly complicated my own workflow. A while ago I started over with the new IMatch 5 and while there is a bit of a learning curve while you get to know its features, it's amazing to see how flexible and customizable IMatch is. If you have an existing workflow, you should be able to adapt to your needs as the developer made sure that IMatch fully makes use of the existing metadata in your files, and is also compliant when writing back metadata for use with your other programs. For me without a good workflow yet, IMatch helped me in coming up with one for organizing my photos that should make it easy for me to locate any of my photos. With the huge backlog I have, I paid extra attention to not repeat the mistake I made all these years ago, where I tried to categorize / describe too much about my photos. Now I just have a few key categories that I apply and I can also tell at a glance which categories are missing from each photo. That way, I can easily work on other photos if working on a certain set of photos gets too boring. While having a huge feature set and tons of settings might be a disadvantage, the developer has added a superb help file to the program. The help provides not just a short explanation of the features and settings, but in depth information along with workflow suggestions that help you decide whether a certain feature might be beneficial for you. In addition to the extensive articles in the help, the developer is very active on the community forum. Pretty much all the time I've received super quick answers to my posts on the community, often within a few hours. Another great thing about IMatch is the constant stream of free updates, which not only include bug fixes, but also new features. While there isn't a Mac version, I can confirm that IMatch works great on Virtualbox on a Mac laptop. I have the database and cache images on a fast USB drive and use that on both my Mac laptop and Windows desktop. All in all, IMatch offers great value for little money and in a short time has become an invaluable asset in managing my photos and videos (and potentially other files in the future). Comments: I'm a professional Sports, Festival and Press photographer meaning I have to manage and tag thousands of pictures every year. I also need to find specific pictures in my archive very quickly... with just a couple of clicks. The latest version IMatch5 brings many new features. It has proved very stable and the speed is very good indeed. The interface and the depth of information that can be searched and sorted is truly amazing. The screen layout can be adapted to your own specific requirements and the tools available must make this the most adaptable program on the market. Number of files (mostly NEF, JPG, PSD and TIFF): 340,000 images!!! I have IMatch5 set to make a full size cached version of every image (including JPG's). This allows be to take a 'complete' version of the database including the cache to clients on a laptop allowing them to view pics full-screen and even zoom to 100%. This obviously explains the huge cache size. I also push the boundaries by setting IMatch5 to render 600 x 600 pixel thumbnails. The resulting 'thumbnail view' in the database is superb and still allows me to scroll through folders with very little lag. I found the default size (200 pixels I think) too small on a large screen. 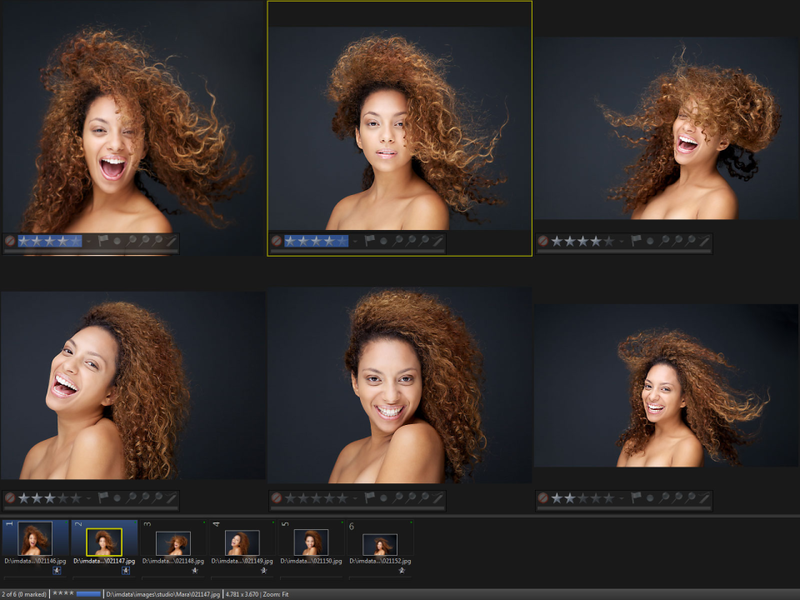 I had also been spoilt by Lightroom's larger thumbnails. My desktop computer is several years old - Intel i7 CPU 975 @ 3.33ghz with 12GB RAM. I've upgraded the desktop system disk to a Samsung 500GB Pro SSD which keep everything moving along quickly. The IMatch5 database and Cache are also stored on a separate Samsung 1TB Pro SSD. You would expect that my large quantity of images should be handled by a 'specialist' program costing many, many times more than IMatch5. But I have 'grown-up' with several previous versions of IMatch and it continues to 'mature' seems to handle whatever I throw at it! The support offered by Mario Westphal is fast, detailed and helpful. This also gives me confidence in the program. I hope this comment enlightens other possible users and gives you confidence that, in this digital age of taking so many pics, IMatch5 should see you well into the future. I have no link to Photools IMatch5 other than being a very satisfied user. Pros: Ability to look at image details and search categories. On a thumbnail I can see camera type, exposure, shutter speed. I can categorize an image and then locate it using multiple search options. 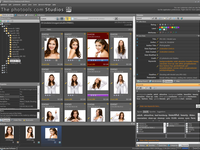 I use this software for my cataloging together with LR6 for my processing. Lightroom cataloging is way behind this software... wake up Adobe!!!! Cons: Learning curve can be a little steep, however the forum is very supportive. As it is active a search can find a solution to most issues. If not found then users and especially the developer is very active. One usually gets a response in a few hours... more often less than an hour. Recommendations to other buyers: Updates and new features are regularly found, certainly within 3 months, and usually sooner. Price is very reasonable, especially when one considers what is available. It is only a VERY major release that will incur an upgrade fee. I am always surprised by the increased functionality that comes without an upgrade fee. Comments: There are so many facets to this amazing resource that it is not possible in a review of this type to cover them all. Many aspects are covered by other reviewers, so I will concentrate on what is the most useful to me - the thesaurus. -Species (genus + specific name: e.g. "Bellis perennis"
The hierarchy can be as simple or complex as required and can cover a great variety of taxonomies - for instance Geographic, Genealogy etc. In IMatch, by clicking on the lowest level (Species), all levels are written to the file as a hierarchical keyword and then automatically broken down into individual keywords. At the same time the IMatch database is updated. A simple template can be created that will then write any of these keywords to other metadata fields - e.g. writing "Bellis perennis" into "Title". This ensures that consistency and integrity of the database and titling and saves a lot of time. But it does not stop there. The thesaurus also caters for synonyms. So in the above example, the English Common name for "Bellis perennis" is "Daisy", French "Paquerette vivace", German "Gänseblümchen" etc. All these terms can be added as synonyms of the scientific and will then be written to the file's metadata and the database at the same time. The file's keywords are reproduced in the IMatch Categories view and panel, from where retrieving files is simple and fast. IMatch also provides comprehensive search and filter facilities which act on this information. For example, it is possible in my IMatch database to filter all images of, say Orchids from the Mediterranean area; this takes only a few seconds to set up and activate. Maintaining and editing the thesaurus is simple. Without the thesaurus managing my large collection of botanic images would be greatly more difficult and time consuming. I started using IMatch for my collection of digital pictures. But IMatch proved to be flexible enough to be used for other kinds of digital documents, so now it has become also a document management system for my personal documents. As often, maximum flexibility comes at a price: The vast number of options and possibilities might appear a bit overwhelming at first. My approach was to use IMatch mostly in standard configuration at first, gradually advancing to some of the more complex features afterwards. This works very well if you do not have too exotic requirements. Alas, you should be able to understand the English language: While IMatch itself is multilingual, the help file is only available in English. And I really recommend reading the help to get a feeling what is possible in IMatch. It is certainly worth a read (or two, or three). Because there is often more than one way to to something in IMatch, it helped me a lot to re-read the corresponding chapters to understand the advantages and disadvantages of using one feature in spite of another. It is all there in the help file. One last point: I am not a professional photographer, but there are a lot of them in the community. And it is inspiring to learn how pros organize their workflows. And I also learned a lot of what IMatch can offer, definitely more than I would have discovered myself. To sum up: An excellent tool with a more than reasonable price tag, and very well supported. Highly recommended! Comments: I spent six years searching for a program to help me organize my image files. I downloaded and tested all I could find. After Christmas of 2000 a friend recommended IMatch. I downloaded and installed the trial version. The first thing I did was to read the Tutorial which gave me the basics I needed to begin using IMatch. I quickly learned that I had found the program I wanted and in less than two weeks I bought my license. countless comments about the "steep learning curve" for IMatch. IMatch is a feature rich program. Mario (the developer) is highly tuned to user needs and adds new features to accommodate users needs. As a result IMatch is indeed a complex application and if one tries to learn how to use every feature that person will spend a lot of time learning IMatch. Time I consider wasted. It is not necessary to learn how to use all that IMatch has to offer just to use IMatch to meet one's needs. With IMatch 5 this is even more applicable. Although I have been a member of alpha and beta testing groups and learned of features as they were added, there is no way that I can claim to know how to use each feature. Mostly what I learned was which feature would be useful for me. I doubt that I use more than about ten percent of IMatch 5's capabilities. Yet within the ten percent I find a Digital Asset Manager that will do all that I need. I read of IMatch users who manage hundreds of thousands of files. I manage about 10,000. Thus IMatch 5 is far more powerful than I need, yet I would not consider leaving IMatch due to it being complex. IMatch 5 is easy to learn if one sticks to the basics. Mario has provided an outstanding help system that is top of the line. In addition Mario and the IMatch forum members are extremely helpful. I doubt that anyone trying to learn a new application would find any better help than what is available for IMatch 5. Best DAM product on the market!! Cons: That a lot of people don't know it! Overall: I use IMatch as my picture database for more than ten years and am still delighted about its capabilities and the tremendous support, provided by his maker Mario Westphal. The variety of product features is second to none, such as the ease of tagging pictures with keywords and categories or exporting pictures with reduced resolution. Complex renaming is extremely easy and the search speed (I manage more than 100.000 photos) is incredible. I haven't found a competitive product that provides such a flexibility, ease of handling and product support for such a price. I am looking forward to exciting future developments. Recommendations to other buyers: I never bought a piece of software where I got such a quick response to my queries. Incredible and unheard of in the software industry! The heart of my workflows involving all my PC's digital assets! Comments: I first encountered IMatch while working in a University-based department of Orthopaedic Surgery and Sports Medicine. The program was very inexpensive and yet powerful, letting me manage the diverse digital resources of twenty-five teaching physicians and thirty residents. Unlike other programs I found, IMatch did not have problems with very large collections of digital assets. 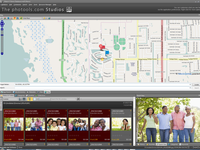 A few hundred thousand images, documents, videos, Powerpoint shows and more could be managed with great flexibility. Specific items could be found rapidly by searching the files and all their metadata. Now IMatch, in version 5, has become an even more powerful and stable Digital Asset Management tool. It's already-strong list of features has grown, and it boasts amazing power to manage the digital files on one's Windows PC computer or network. The developer, Mario Westphal, keeps upgrading the current major release, and is more responsive when problem or questions arise than any software company EVER. He is helped in this by the company's very active online user forum, with both new users and an international group of longtime IMatch experts, who are happy to help others with many of the advanced features that the beginners may want to grow into as they define their own workflows and management needs. While no one user may need more than 50% of the features in IMatch, we each rely on different parts of this most impressive and flexible DAM. Finally, the data that one manages in IMatch 5 is all exportable to other standard and open formats; so if the developer ever were to abandon further refinement or upgrading of the program, the criteria and metadata entered by users, and used to manage IMatch databases of digital assets in so many helpful ways, can all be preserved. It is an amazing program, and an amazing value for its modest price. Unparalleled flexibility in organizing and searching. Wonderful support. Simple backups. Pros: It can be customized to one's liking and is extensible with scripts and apps. The support is the best I have ever encountered - for any software - and the active forum is extremely helpful. I have used IMatch since 2008, it was already excellent then, and it got better - major better - with every incarnation. For organizing photos it is far superior to what is included with various photo editing programs (including Adobe's), and for editing photos, one click can send the selected picture(s) to any editing program of your choice. Backups are simple and facilitate easy moving between computers, such as desktoplaptop for those who need it. Overall: Finally got to organize my lifetime collection properly, with categories, timelines and comments. Was able to put proper dates into the EXIFs of scanned old photos to put them in the proper place chronologically. Enjoyed following the forum threads to learn more. IMatch is an outstanding piece of software! Pros: When you work with large image collections we would say IMatch from Photools does the job. It doesn't crash! We used various well known DAM solutions and they all crash regularly. Queries receive a quick response, issues are solved. The software is powerful and reliable, all this for a low price. Highly recommended! Cons: It has a learning curve. It took a while to figure out how to perform fast searches on a large batch of images. Extremely flexible and powerful DAM, highly recommended! Comments: Whenever I am looking for a new program I use to write down my requirements. 1. It should allow me to find any image in my collection based on criteria defined solely by me. 2. It should play nice with the raw processors, image editors and printing software I use in my workflow. 3. It should not lock me in, so that I can move on should the program be no longer supported or when my requirements change. 4. It should be fast, not slowing down to a grinding halt when my image collection grows. 5. It should be expandable, when a specific function is not provided 'out of the box' it should be possible to add functionality by means of scripting or plug-ins. 6. It should be actively supported by the developer, no 'abandonware'. 7. It should be affordable, no business model which forces customers to pay for a new version which just fixes long outstanding bugs. IMatch meets and exceeds all these requirements easily. It became the highly flexible, fast and reliable 'central hub' in my workflow. The support from the genius behind this program is unparalleled, it seems like he is always there, answering questions, fixing the occasional bug, adding new features to the program. The documentation is a masterpiece in it's own right, I have never seen something like this before. Last but not least, there is an active and friendly user community where users share ideas and experiences and where they help each other. My only point of criticism might be the price setting, given the flexibility of the program, the continuous development and superior support a higher price would be easily justifiable. + support from the developer is outstanding: I have special wishes and he implemented it in one day; never saw this on other software products. Comments: I have used Imatch for nearly 10 years to manage a collection of about 180,000 images from digital cameras, scanned photos, slides and negatives as well as movie clips. I can tag, sort, filter and organize all files easily. Finding any picture or movie is a matter of seconds. I really like the addition of the time line view in Imatch 5. After folders with media files are added to the database you can see the pictures for a certain date, month, year or any other time frame without any effort or tagging. It does not matter where the files are located on your computer or network. Sure you need to have the camera time set correctly, if not, it's easy to correct the time stamp with Imatch. Imatch has a lot of functionality, don't try to learn it all at once. It's easy to start with just adding categories and ratings and expand your workflow if needed later. Imatch comes with a superb documentation, a great user forum and great support from the developer Mario. Imatch also comes with a scripting engine. You can either write your own script or use one of the scripts which comes with Imatch or find one posted on the user forum. Not many programs on my computer run as stable and are as affordable as Imatch. There is no subscription fee or yearly upgrade without any new functionality. Imatch does not lock you down with proprietary formats, all information and meta data can be written to the files or exported. Comments: I have been using IMatch 5 since the first beta version became available and with every new update it is getting better. I use it exclusively to catalog my photographs (RAW and jpg files), but it supports many other file formats. The search and filter functions, key features for my workflow, offer a great number of options so you can easily search for various combinations of metadata. The program offers seemingly endless number of settings and customizations which includes also the user interface. Thus, thumbnails can be customized to display metadata of your choice. This can be further combined with color codes which makes orientation in the list of thumbnails even easier. For more advanced users the software offers scripting thus broadening its versatility even more. Finally, I should mention excellent support provided by the software developer. Questions posted in the user forum are usually answered within couple of hours. Moreover, bugs are fixed fast, the more annoying ones (they are very rare) immediately, others are being corrected continuously with every new update (usually every one or two weeks). Updates often add various useful improvements. It is very hard for me to find any con, but if I really have to name some, it is probably a relatively steep learning curve. But it is a trade-off for a complexity of the software which in a long term is very useful for every serious user. Comments: I tried several DAMs before, when I tried IMatch, I was simply overhelmed by the power and possibilities of IMatch. I am using IMatch since 2001 and the "new" IMatch 5 is really a milestone ahead. I do manage all my photos (nefs, jpgs, tiffs) and all my office-files of my photo-agency, what is located in Switzerland. At the moment I do manage by IMatch 210'000 files, no problems with searching. Specially great I think, is the automatic version-system of IMatch (when you create for example jpgs from raws) and the manually or even automatically stacking - helps decluttering the screen a lot! Further I am very free to create my file windows - system (how the thumbs appears), using the famous categories (very strong) and take advantage of delivered scripts or I can create myself time-reducing scripts. Last but not least is a kind of "excell" integrated, so called Attributes, what helps me manage my bills and text and numbers, without storing them inside the files or sidecars (like Metadata, Exif, IPTC and so on), because Attributes will be stored only inside the IMatch-database. IMatch offers much more, than I can now review here, things like Apps, statistics, automatically data-driven categories, batch for outputs, slideshow, creating web-galleries and much more. Give IMatch a chance, you will be impressed! Pros: The ease of use, it just works as advertised, no hassle. What other software do you feel as the number one user. Pros: Love that it supports wide range of formats. I mostly work with Raw and JPG and never had any issues importing images. Makes editing easy and able to add pertinent info in the IPTC field such as copyright, photographer byline gps coordinates ETC. Easy to tag photos and add to favorite and edits. Cons: With this software gave you the chance to upload images directly from cameras, or SD cards. I first have to upload them to my External Hardrive and then export them. seems like an extra step that adds a bit of time in the long run. Specially after shooting a 2000 image wedding. Also it does not have image editing capabilites which can come in handy for small image tweaks like cropping or color correctiong. This would help avoid the dreaded lightroom editing rendering time. Superb program for managing images and other digital data! Comments: I use IMatch to manage a collection of nearly 50,000 images from digital cameras and scanned photos, slides and negatives, as well as a separate collection of over 5,000 audio files. IMatch allows me to tag, sort, filter and organize my files in a variety of ways, using open (not proprietary) standards. 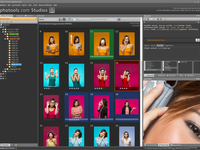 It facilitates an efficient and integrated work flow for new images, including 'developing' of RAW images with DxO Pro, Lightroom, Photoshop and other programs and organizing the 'developed' output images. IMatch can be used 'out of the box' to manage files and can also be extensively customized to suit a user's specific needs. The developer is very responsive to user needs and requests and ships frequent updates of the program. The user community is also very responsive and helpful. A 30 day trial version is available to let potential users make a thorough evaluation before purchase. I could go on and on, but the bottom line is that this is a superb program for managing digital data. Comments: IMatch is a phenomenal piece of software that I've used for several years. The dynamic categories provide an intuitive way to organize your photos. That coupled with the filters, metadata, ... make it extremely useful. It's a tremendous asset in cataloging and managing images of any kind. I have a collection of about 100,000 photos in it now, and I also use it with scans of business cards -- they're assigned categories and the contents entered, so now searching either via name or categories (e.g. restaurants in Bangkok I've rated 4 stars) is a breeze. The "problem" with previous versions of IMatch (version 3.6 and earlier) had to do with its' rather complex interface that was more "geeky" than many could handle. With IMatch 5, he's completely overcome that problem and something you can use after just a bit of an introduction. 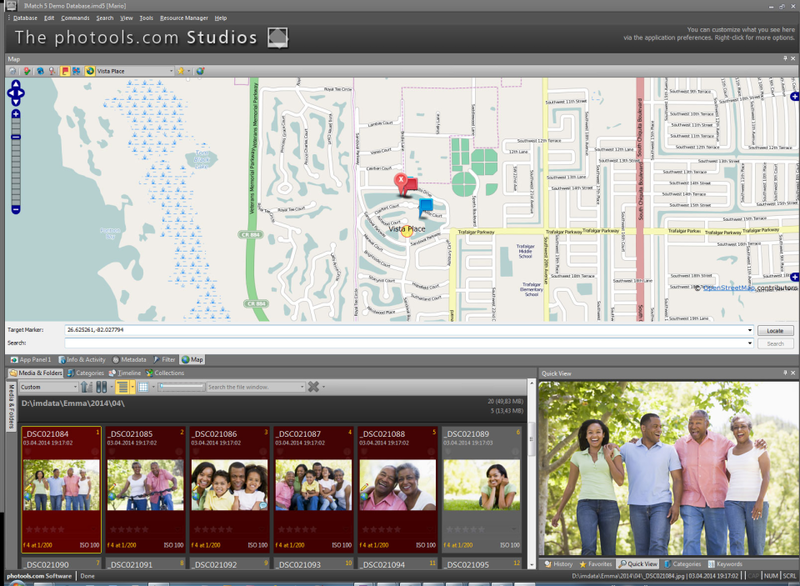 And it integrates well with Photoshop, Lightroom, and other photo software. 5 Stars in my book! Comments: I have used IMatch for nearly 10 years to manage over 250K image files (plus nearly 10K others such as music, video, and documents). Over the years it's been great and just keeps getting better and better. I couldn't imagine doing without it. It has a great (and highly configurable) interface and unparalleled documentation. No matter what new challenge I throw at it, there's a way (usually several) to get it done. And it's fast even with the load I place on it - barely have time to get a cup of coffee even when managing and manipulating massive amounts of data. You will NEVER find better customer support (or documentation) - EVER! Questions are answered almost immediately. Bugs - rare though they may be - are fixed quickly. The user forum, where the developer himself posts info & replies many time each day, is a treasure trove of information. I could go on (and on & on...) but you get the idea - I really like IMatch. Cons: It has so many possibilities, i think i do not use 10% of it. On the other side : i consider it as a challenge to learn something out of my confortzone. Overall: Friends come to me asking for pictures of a certain moment, or a certain place. It takes 5 sec to find them. Comments: Managing photos in IMatch5 is easy and intuitive, making it a snap to use by beginners. Under the surface though, there is a highly sophisticated and powerful piece of software that enables more advanced users to search, categorize, and catalog their photos in incredibly versatile ways. If there is a particular "view" you want of your photos, IMatch5 can be adjusted to provide it. In fact, you can define as many views as you like, then call them up as your needs change. If you really want to customize your use of IMatch5, it has a very powerful scripting and app templating feature. The program is exceptionally well supported by the vendor, and has a large, active, & knowledgeable user forum. The vendor provides product updates on a regular basis, and the help system is one of the best I've ever experienced - detailed, deep, and updated in sync with every product update. Highly recommended. Comments: Extremely competent and extra-ordinary versatile product for managing pictures. Is also capable of managing other types of files (although I don't use it for that purpose myself). IMatch can be tuned to your personal wishes and work-flow, but is also usable out of the box. You can use it without any training and gradually work your way up the ladder and tune it to fulfil all wishes. Works seamless with other software (I use PS5 for editing pictures and IMatch for managing pictures, no LR or Bridge for me any longer). Pro's: no vendor lock-in (like e.g. Adobe products), very regular updates (bugfixing and functionality updates), extremely good support from vendor and on user platform, multiple language, low system requirements. Comments: I have tried a few different image management programs and was the happiest with IMatch. The latest version is a real home run. I like the ability to change layouts based on the type of work that I am doing and to save those layouts and bring them up when necessary. I also like the ability to move parts of the program to a second monitor. Keywording is easy, especially with using the letter key to bring you to keywords that start with that letter. Adding child elements in singularly or in groups is a real plus. Using templates for commonly used information is great. If there is a downside to IMatch, it is that it is so featured-loaded that it takes some time to master it. I am nowhere near mastering it but when I have problems, I turn to the user forum or email the program's creator to help me find my way. I would highly recommend this program. Comments: If you can do serious work without an asset manager like IM5, good on ya. I'm a geologist and commonly bring 3-400 images back from a day in my volcanoes. I can spend as much time cataloging, categorizing, and keywording my images as I did shooting them. But, I can find what I need rikki-tik when I'm writing. No asset manager this good can be "easy to use," it does too much and offers too many opportunities to do new things to call it easy. Once you get a good workflow going, it is easy, but establishing that workflow is difficult and takes a lot of time. In the best of all possible worlds, Mario Westphal (IMatch), Axel Rietschin (FastPictureViewer) and the Lightroom team would go into a room and come out with - The Best of All Possible Worlds! Comments: I am using imatch since version 3 and am VERY happy with the new version 5. It is fast (even for thousands of files - I actually have approx. 40.000), very well supported and does not force you to use a certain external tool - you can use photoshop, gimp, lightroom, whatever you like. The only perfomance issue that I observed are data driven categories. They are very powerful, but should not be updated on the fly to avoid performance issues - update them on demand (this is an option). The support is really good. In the user-forum, you get very fast answers from other users, but also from the programmer. You can even use the tool for office or music files - they are all supported. Comments: I used ACDSee, Idimager and Photosupreme by the past. I switched to IMatch about 18 months ago, and I am completely satisfied. Imatch can be easily customized to match your workflow, it does integrate with several "add ons", like geosetter, and downloader pro. Beyond my own pictures, I also manage in a separate database my administrative documents (mainly pdf), and home videos in a 3rd database. The support web site is very useful, the training material is very good, and the support is awesome. Comments: Having worked with a lot of Digital Asset Management software aimed at professional photographers I have to say nothing comes close to IMatch for flexibility in storage and metadata search . I currently have over 100,000 RAW, TIF and JPEG images within a single database and retrieving the correct images is super fast. I can search by client, keyword, date or any metadata item that you care to mention or want to create for future reference. Now that flexibility does come with a small learning curve but it is well worth the effort for the rewards it brings. Customer service is second to none with the developer responding to queries within hours if not minutes in my experience. Used this software and it's prior vers. as an advanced amatuer to form a searchable image catalog. Comments: This software and it's prior version has given me the ability to find images very rapidly for various photo projects. My workflow includes an IMatch, Lightroom CC and Photoshop CC grouping. This combination works seamlessly together. It is the essential DAM portion of my image environment. The customer service provided by this developer is outstanding and far exceeds that found by me from any of the other multitude of companies dealt with everyday. The help system supplied with the software is the most complete and up to date I have ever seen. The response time to queries to the developer is sometimes minutes and always thorough. Awesome program to edit and manage your photos and videos. Pros: The main advantages are the speed with which it allows searching the photos in the database and its ability to convert in situ metadata. Cons: Its impossibility to import the photos and videos from the camera directly and export to social networks once edited. Extremely Powerful. Great Value. Excellent Support. Comments: Have around 200.000 Images in my database. Have been a user for over 10 Years. Very happy I use this sw... very powerful if you need it to be, but can also be used "as-shipped". It's as simple or complex as you need it to be. I use it often with filters, keywords and categories to find images and determine which ones to process furher. I export and import to / from other apps as needed. Never had problems. I also love it's robustness. Updated often and the customer support is excellent. And in terms of price. Excellent value for money! Comments: I use IMatch for many years, primarily, for the picture management. Till present with IMatch there is nothing what not anyhow is to be solved. Many achievement signs have been realised in the topical Verion. If then something really exotic is required, this can be realised very well about the available Script possibility. The Support by the developer is really exemplary, here quite a lot of software manufacturers can cut off to themselves a disc. Cons: Nothing has been observed as con. Just need to focus on performance improvement. Comments: If you are willing to spend on the pricetag of this product, then you will love it. 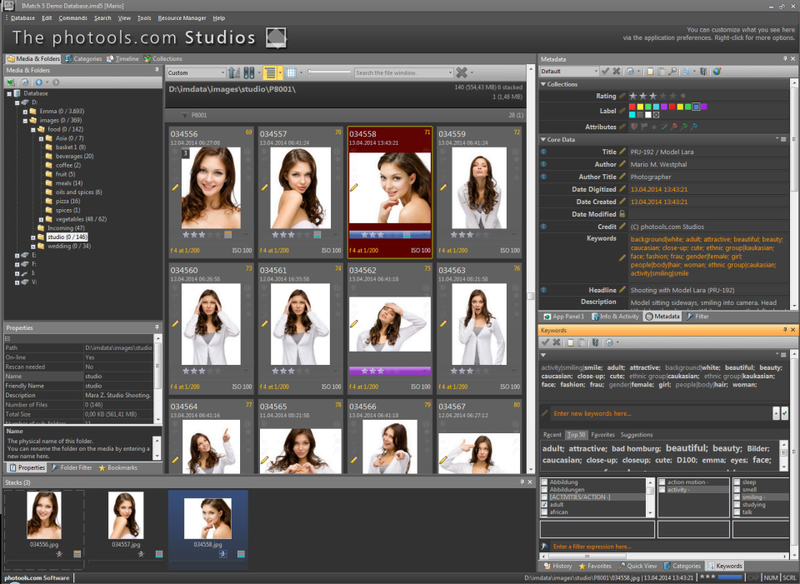 It has a wealth of features and options that is comp to Photoshop. That being said, there is some learning curve to it.